The Health and Wellness and Transportation departments are happy to announce the launch of the Safe Routes to School (SRTS) program in Boston Public Schools through the CDC Partners to Improve Community Health (PICH) grant. 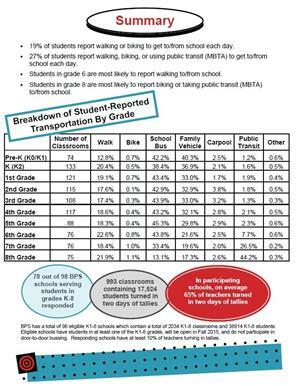 We are partnering with the Boston Public Health Commission’s and other city agencies in an effort increase the number of students in grades K - 8, who regularly walk, bike or take the MBTA to school. Most children and youth don’t meet the national recommendations of 60 minutes of daily physical activity through a combination of in-school and out-of-school activities. A sometimes-overlooked opportunity to help kids to get moving is their commute to and from school. An added bonus of this approach is that students who are physically active arrive at school ready to learn and become better learners! Safe Routes to School (SRTS) supports efforts to increase students’ active transportation by addressing multiple issues that impact how they commute. These may include inadequate street infrastructure (dangerous intersections, lack of crosswalks, poor sidewalks, etc. ), concerns about crime and personal safety, lack of student education about pedestrian safety, and school or community cultures that promote driving. 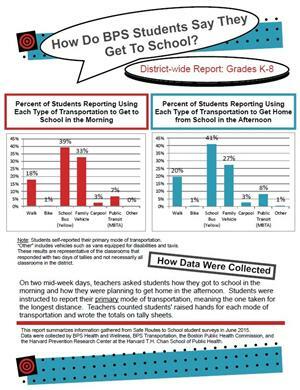 Distance from school has also been a major issue that impacts the commute to school. BPS’ revised school assignment protocol now offers families school options in their ‘walk-to zones’. Each year, an increasing number of BPS students will live within a walkable or bikeable distance to school. The SRTS program will allow schools to get ahead of potential issues by implementing necessary interventions as more students switch to active transportation to school. BPS is working with city agencies and community organizations to develop an implementation framework. This will include informational materials and communications efforts that reach all BPS students, families and staff, as well as alignment of programming through community partners. We are encouraging all schools to participate in the Hand Tallies going forward to provide data to identify other priority areas of need. Our work is being leveraged through other City of Boston initiatives including Vision Zero and Slow Streets, and we hope to partner with other City departments to help sustain the Safe Routes to School program in Boston Public Schools. We are working with the Safe Routes to School National Partnership to use evidence-based ‘best practices’ that support successful SRTS initiatives. These can be summarized as the “six E’s: Education, Encouragement, Enforcement, Engineering, Evaluation, and Equity. Data gathered through hand tallies last Spring and this Fall helped identify 26 schools demonstrating a need for SRTS program. BPS Health and Wellness Department will assist 20 K-8 schools in implementing education and promotion programs that support pedestrian safety. Additional supports will be provided to give students, families, and school staff the ability to build school capacity to self-advocate for and build SRTS programming. A nationally known engineering firm has been engaged to conduct walk audits at these schools. Additionally, in many school neighborhoods, Healthy Community Champions will offer community-based supports and partnerships for SRTS implementation. Funding also supports SRTS Wellness Champions at the 20 priority schools to lead SRTS efforts. Tell us how we are doing! We welcome all feedback, comments and questions.